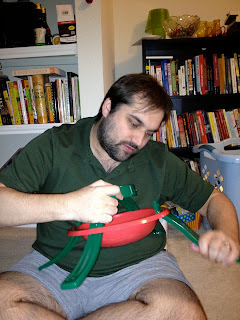 At Home with the Hinkleys: Christmas-y Weekend! 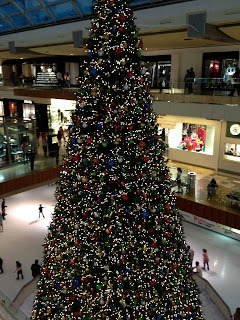 We had a fantastic weekend of Christmas filled things! I did happen to squeeze in a little studying for my two finals this week, but that is boring so I wont talk about that, lol. 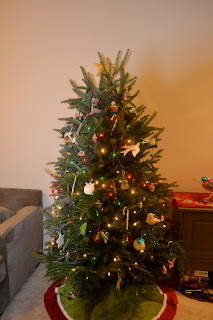 We live smack in the almost middle of the city near zero Home Depot's or Lowes', so we took a mini journey to the closest one we know of to pick out a tree. I had wanted to go to this local farm place where you go cut down your own tree and take hayrides and drink cocoa but we decided there just wasn't enough daylight hours to get out there, esp when I wanted to get the tree a week ago. Approximately 30 minutes. Thanks for asking. After we got the stand set up, we needed some dinner at Red Lobster, which is my fav! This is Aaron's entry for Lobstar of the Week (scary, right?). Maybe we will win this week? ha! 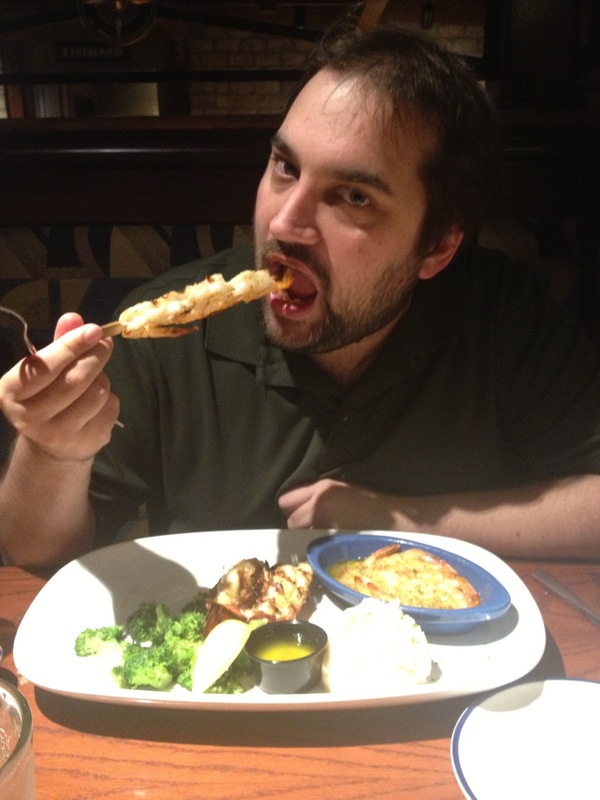 Side note, go ahead and make fun, I am well aware that Red Lobster is like the IHOP of seafood, but it is soooo good. Houston's seafood restaurants are 95% Gulf seafood style, so they don't do Northeastern crab legs and stuff. Plus cheddar bay biscuits are the bomb.com. You know I am right! Here is the tree we adopted. We got home and set the tree up and watched National Lampoon's Christmas Vacation. Are you sitting down for this? I had never seen it before! Weird, right? When I was a kid, I missed out on about a billion movies that everyone else has seen because I was watching Dirty Dancing or Troop Beverly Hills on repeat. I stick to what I like, lol. Now that I have seen it, I fully understand all the references that are made to the Griswold's in different shows and commercials. It was a really cute movie, and so fun to see the child version of Leonard from Big Bang Theory! This table got decorated too. 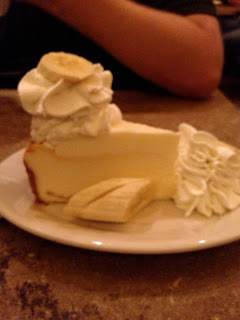 And then there is the cheesecake factory.... win! We got a good chunk of shopping done for the friends and family, so that takes a bit of a load off! Yay for getting your Christmas tree! 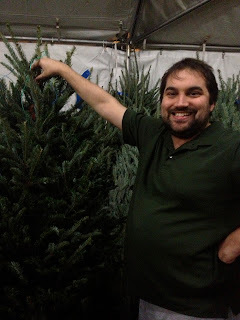 I wanted to go to a tree farm this year too, but we just went to Home Depot instead. Now I am kind of regretting not taking Mason to the tree farm! Next year, right?! I still can't believe that you had never seen Christmas Vacation! But I am glad that you have now, haha! And I love that Johnny Galecki is in it. He almost doesn't even look like the older version of him! And Cheesecake Factory? Yes please! P.S. Your tree looks great! sounds like an awesome weekend!! I am the exact same way with movies. There are SO MANY that I haven't seen that people are always like "WHAT?!?!" but I'm slowly working my way through them....one of which is It's a Wonderful Life which I am determined to watch this year! You're tree looks gorgeous, I can't wait to decorate our this week!